← Further Adventures in Sous Vide Cooking! Many of you may know Whole 9 as an online community for a Paleo based diet and the source of an amazing amount of easy to understand information about the science of Paleo. You are correct of course, but they are also a tremendous partner for offices like mine as Nutritional Consultants. 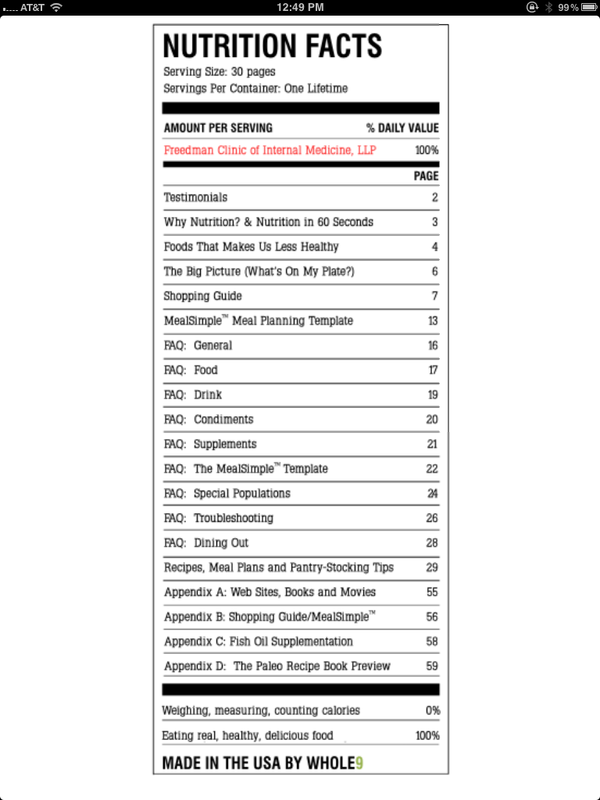 For a very reasonable fee you can partner with them to create a COMPLETE guide to paleo centered nutritional recommendations for your clients or patients. I feel like a kid in a candy store now that I finally have it, and I’m handing them out like hot cakes. As many of you know, taking a Paleo naive patient and explaining to them in detail what we eat, what we don’t eat, and most importantly why, is very difficult to do in the restraints of a typical 15 minute appointment. With this guide I am able to introduce the key concepts, explain to them why I feel it is so important, and give them a product to take home that will be a complete introductary guide to how and what to eat, as well as explaining to them WHY! The guide is able to do so in 10 pages or so and is very easy for a layperson to understand. It also includes further vital information for a newbie such as a grocery guide, meal planning guide, a comprehensive FAQ section answering most common questions I can think of, and a good set of recipes to start. As a bonus, it also includes a custom personal guide to the Whole 30 program for each patient if they are so inclined. Like I said, this is a extremely well put together and laid out collection of information for a very reasonable price. Here is a look at the Table of Contents! If you are in the business of helping people improve their health, and you are looking for a comprehensive guide to helping people adapt to a Paleo based lifestyle, I highly recommend partnering with Whole 9 Life and having them customize a Nutritional Guide for your business. I have no financial relationship with Whole 9, and get nothing if you work with them, I just feel this kind of product can help you as much as it has helped me and my partners. I can finally concentrate simply on pointing patients in the right direction, and letting our Nutrition Guide educate them and fill in the details. Interested in how I approach patients about adapting to a Paleo lifestyle, check THIS out. is it possible to get a copy of your Whole 9 Nutrition Guide? Sorry, contractually and liability wise I can only distribute to patients. But u may try to find a doc near you who uses one. I am a Registered Dietitian just beginning to learn about Paleo Living although it seems very close to what I recommend already. 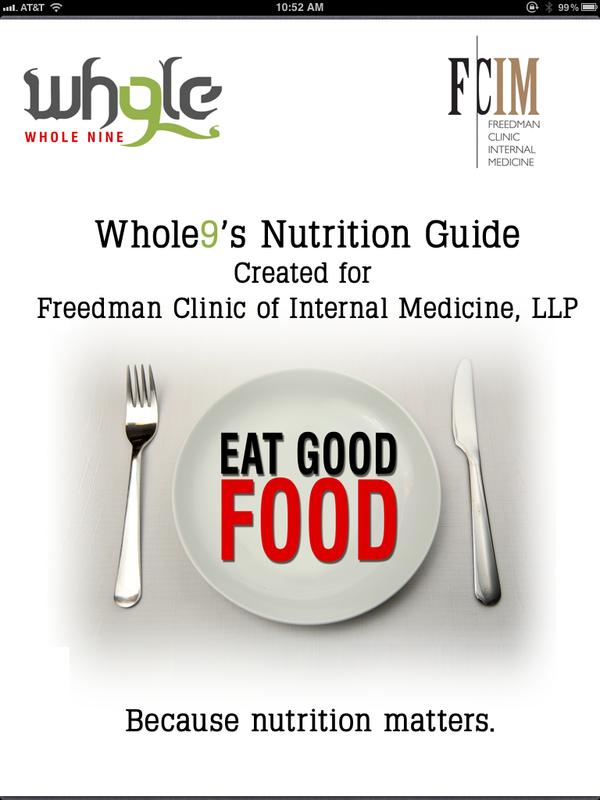 Could you please suggest how I might obtain a copy of the Whole 9 Nutrition Guide to use in my practice? Also if you have any other suggestions for me to learn more I would greatly appreciate any & all help! Contact them at http://www.whole9life.com, they are great to work for. Like I said, cost for what you get is super reasonable. I am so excited to see medical professionals advocating for the Paleo lifestyle. I am beginning PA school this fall and am already nervous about how my beliefs will clash with the traditional nutrition recommendations. I whole-heartedly agree that the foods we (as Americans) eat and the sedentary lifestyles that we lead are responsible for many of the chronic diseases that individuals have. You can bet your bottom dollar that, as a practitioner, I will be an active advocate for primal eating to better the lives of my patients.